Each year, the Oregon City School District honors the late Jane Adrian and Al Gallagher, local educators who made significant contributions to education. 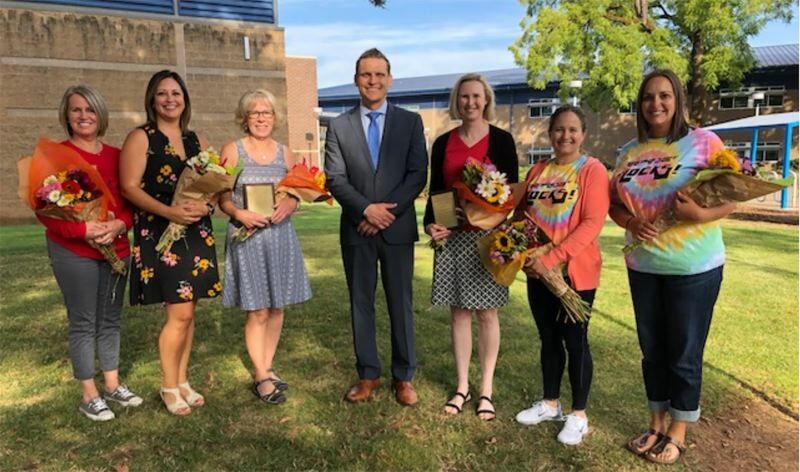 The Jane Adrian Award recognizes educators with a collaborative spirit, a proactive approach to teaching and learning, a positive attitude, and a love of professional learning. This year's winner was Lynn Elliott, a second-grade teacher at Jennings Lodge Elementary. Elliott has dedicated the past 27 years to educating children at Jennings Lodge with love, patience and high expectations. For the past 20 years, she has led the staff and students in a Multicultural Night celebration where students are experts and everyone's perspective on the world is expanded. The Al Gallagher Award is in celebration of employees who support and enhance professional development, demonstrate a love of professional learning, and model the district's mission. This year's winner Jennifer Bell supports teachers as an instructional coach for elementary mathematics. Bell is known for providing professional development districtwide across grade levels, schools and content areas. Her efforts also were recently recognized by the Oregon Council Teachers of Mathematics when she was awarded the 2018 Mildred Bennett Elementary Mathematics Education Award this past summer.